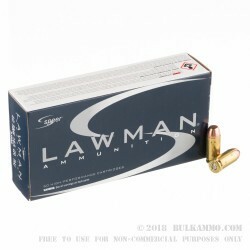 Speer Lawman 165 grain .40 S&W TMJ. (This TMJ is the good kind- not the kind that hurts your jaw.) In our industry, TMJ stands for Total Metal Jacket. Well, what’s the difference in FMJ and TMJ? I’m glad you asked! The difference actually lies at the bottom of the round. Where FMJ rounds are exposed lead, the TMJ rounds are covered. Some indoor ranges are requiring the use of TMJs now to reduce the amount of lead particles that float through the air and collect on the ground. There are debates regarding how much FMJ use is harmful, but if you are at the indoor range a lot TMJs are a solution. 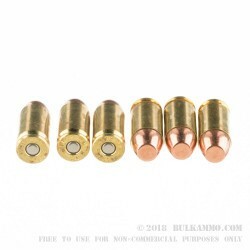 In addition to the TMJ, these Speer Lawman rounds also feature reloadable cases. These Clean-Fire® loads use primers that eliminate airborne heavy metals for cleaner shooting at your indoor range. The spent casings appear unfired when held up to traditional ammunition. 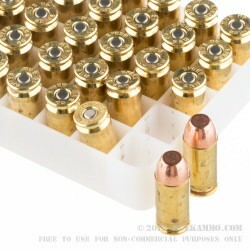 Since the heavy metals have been removed, the end result is a healthier area and cleaner casings for you to reload. The .40 S&W round hasn’t been around a very long time. It made its debut only in 1990! Smith & Wesson came out with this round and it was supposed to be shown off with their S&W Model 4006 pistol. However, for reasons unknown, the 4006 wasn’t available for purchase for a few months allowing Glock to beat them to store shelves with the Glock 22 and Glock 23. Glock beat out S&W by one week! This ammo does not like my weapons. I Purchased 1000 rounds used about 250 and had a 25-30% misfeeds and failures to eject. Will not be buying it again. Q: WHERE IS SPEER LAWMAN AMMUNITION MANUFACTURE WHAT COUNTY. A: Hello Brian, Speer Lawman is made here in the United States.